Working in various capacities, the Care Manager will update patient record; connect with patients in healthcare service to provide excellent care to the patients. 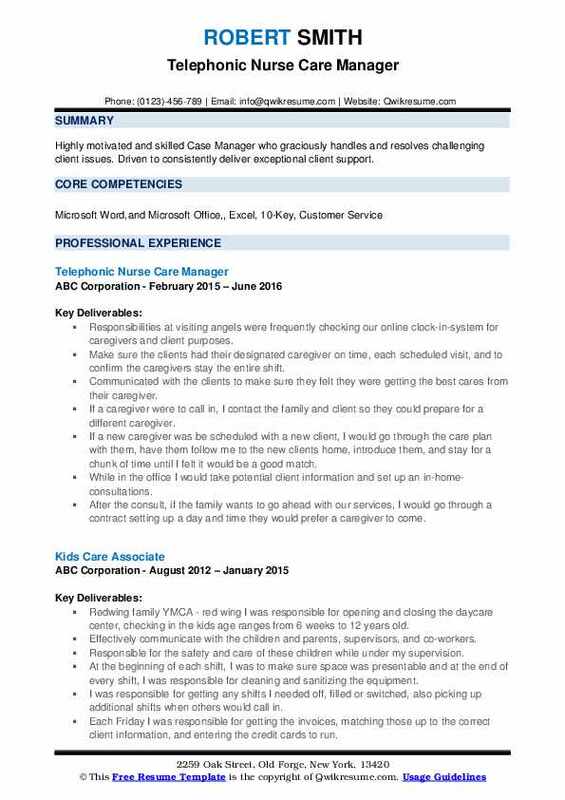 Some common duties listed on the Care Manager Resume include the following – providing patient care as per the needs, maintaining and updating patient records, overseeing patient care at clinics, nursing homes, and hospitals; consulting with clients and guiding them to the correct health professional, contacting insurance companies and determining the exact plan coverage amount and service, and streamlining business operations. 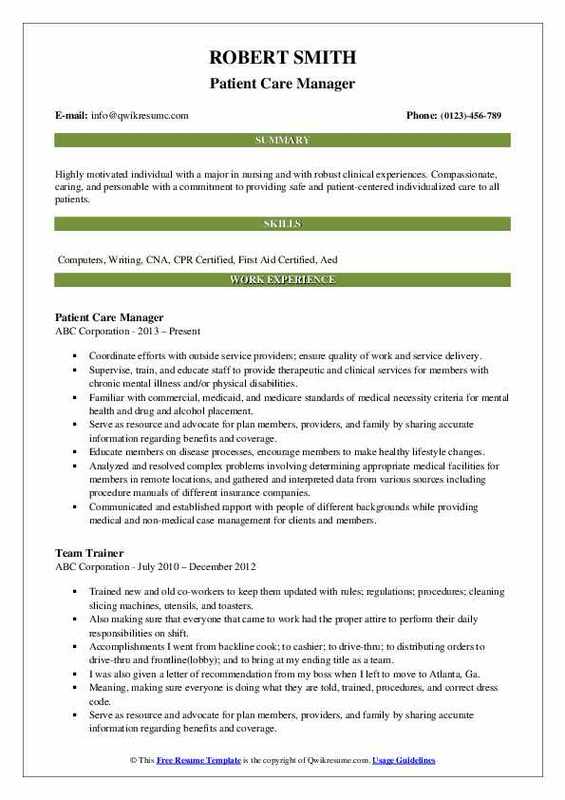 To become a successful Care Manager, the following skills are expected from the applicants – complete familiarity with mental health environment, knowledge of community resources, proficiency in MS Office and hospital management software, knowledge of care management and the commitment to work with the underserved. 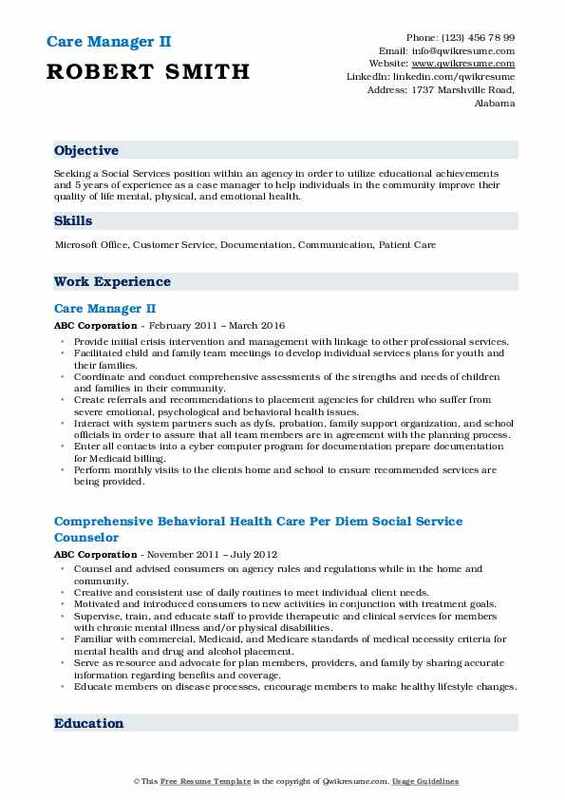 Even though educational requirements are not specific, most of the eligible resumes depict a degree in social work or public health or health science. 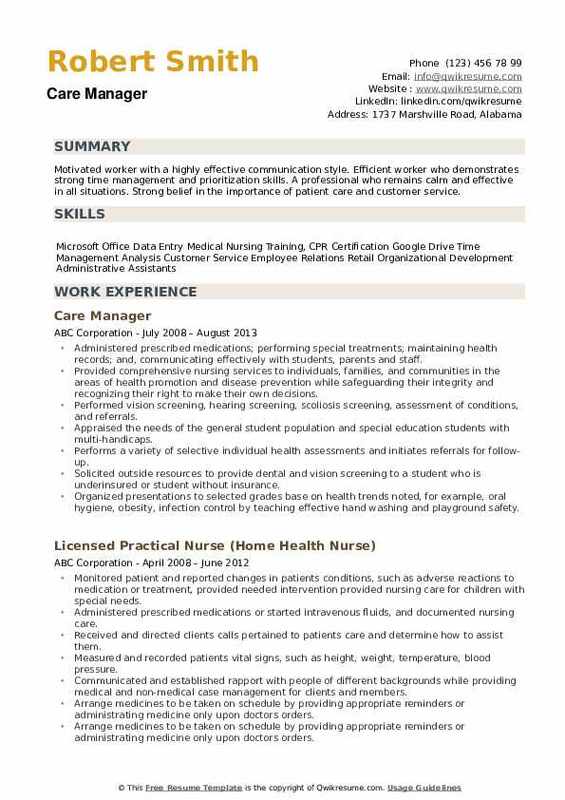 Summary : To obtain a part time employment in a professional health care setting, bringing an excellent record of nursing education and training, community health experience, and outstanding interpersonal skills to give the maximum level of patient care where I can utilize and develop my skills and expertise. 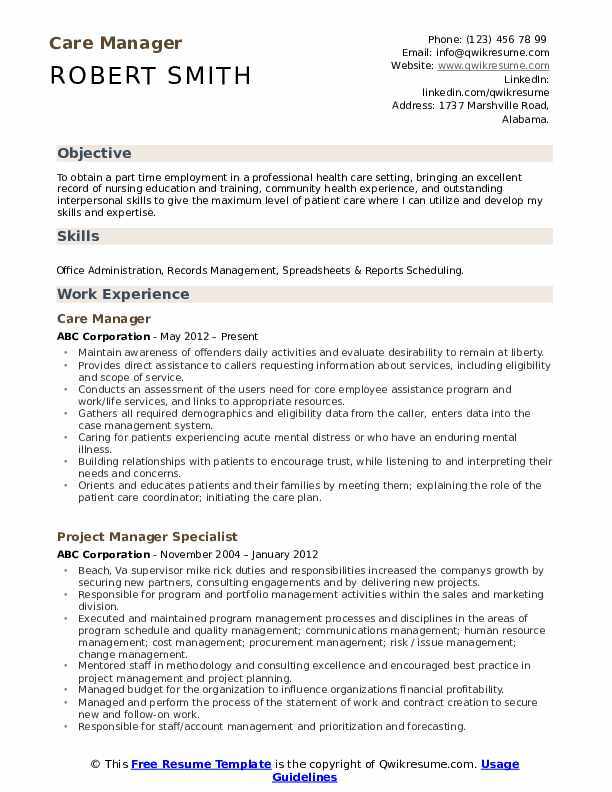 Skills : Office Administration, Records Management, Spreadsheets & Reports Scheduling. Maintain awareness of offenders' daily activities and evaluate desirability to remain at liberty. Provides direct assistance to callers requesting information about services, including eligibility and scope of service. Conducts an assessment of the user's need for core employee assistance program and work/life services, and links to appropriate resources. Gathers all required demographics and eligibility data from the caller, enters data into the case management system. Caring for patients experiencing acute mental distress or who have an enduring mental illness. Building relationships with patients to encourage trust, while listening to and interpreting their needs and concerns. Orients and educates patients and their families by meeting them; explaining the role of the patient care coordinator; initiating the care plan. Providing educational information in conjunction with direct care providers related to treatments, procedures, medications, and continuing care requirements. Objective : Highly motivated and skilled Case Manager who graciously handles and resolves challenging client issues. Driven to consistently deliver exceptional client support. Responsibilities at visiting angels were frequently checking our online clock-in-system for caregivers and client purposes. Make sure the clients had their designated caregiver on time, each scheduled visit, and to confirm the caregivers stay the entire shift. Communicated with the clients to make sure they felt they were getting the best cares from their caregiver. If a caregiver were to call in, I contact the family and client so they could prepare for a different caregiver. If a new caregiver was be scheduled with a new client, I would go through the care plan with them, have them follow me to the new clients home, introduce them, and stay for a chunk of time until I felt it would be a good match. While in the office I would take potential client information and set up an in-home-consultations. After the consult, if the family wants to go ahead with our services, I would go through a contract setting up a day and time they would prefer a caregiver to come. 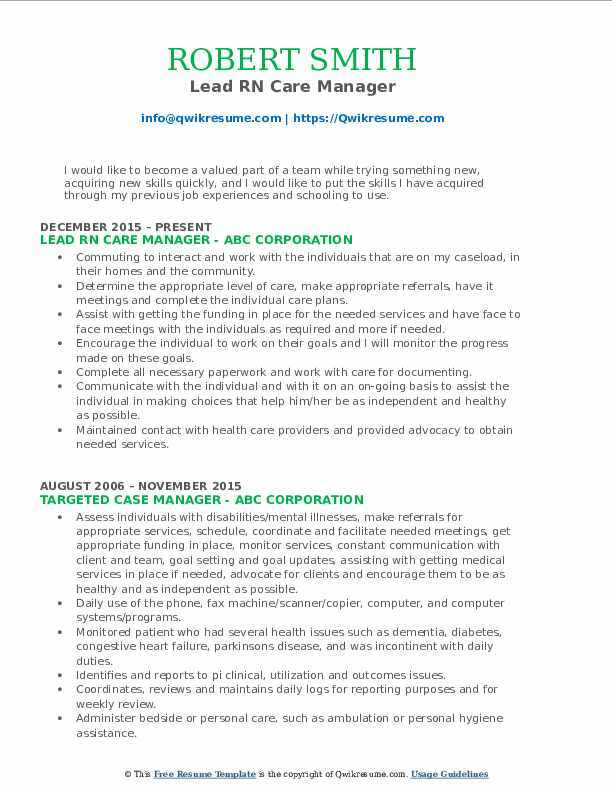 Summary : Highly motivated individual with a major in nursing and with robust clinical experiences. Compassionate, caring, and personable with a commitment to providing safe and patient-centered individualized care to all patients. Coordinate efforts with outside service providers; ensure quality of work and service delivery. Supervise, train, and educate staff to provide therapeutic and clinical services for members with chronic mental illness and/or physical disabilities. Familiar with commercial, medicaid, and medicare standards of medical necessity criteria for mental health and drug and alcohol placement. Serve as resource and advocate for plan members, providers, and family by sharing accurate information regarding benefits and coverage. Educate members on disease processes, encourage members to make healthy lifestyle changes. Analyzed and resolved complex problems involving determining appropriate medical facilities for members in remote locations, and gathered and interpreted data from various sources including procedure manuals of different insurance companies. Communicated and established rapport with people of different backgrounds while providing medical and non-medical case management for clients and members. Headline : Seeking a Social Services position within an agency in order to utilize educational achievements and 5 years of experience as a case manager to help individuals in the community improve their quality of life mental, physical, and emotional health. Provide initial crisis intervention and management with linkage to other professional services. Facilitated child and family team meetings to develop individual services plans for youth and their families. Coordinate and conduct comprehensive assessments of the strengths and needs of children and families in their community. Create referrals and recommendations to placement agencies for children who suffer from severe emotional, psychological and behavioral health issues. Interact with system partners such as dyfs, probation, family support organization, and school officials in order to assure that all team members are in agreement with the planning process. Enter all contacts into a cyber computer program for documentation prepare documentation for Medicaid billing. Perform monthly visits to the client's home and school to ensure recommended services are being provided. Work together as a team with the family and system partners to discuss discharge planning from the agency adhere to agency guidelines and regulations as it relates to agency documentation. Summary : I would like to become a valued part of a team while trying something new, acquiring new skills quickly, and I would like to put the skills I have acquired through my previous job experiences and schooling to use. Commuting to interact and work with the individuals that are on my caseload, in their homes and the community. Determine the appropriate level of care, make appropriate referrals, have it meetings and complete the individual care plans. Assist with getting the funding in place for the needed services and have face to face meetings with the individuals as required and more if needed. Encourage the individual to work on their goals and I will monitor the progress made on these goals. Complete all necessary paperwork and work with care for documenting. Communicate with the individual and with it on an on-going basis to assist the individual in making choices that help him/her be as independent and healthy as possible. Maintained contact with health care providers and provided advocacy to obtain needed services. 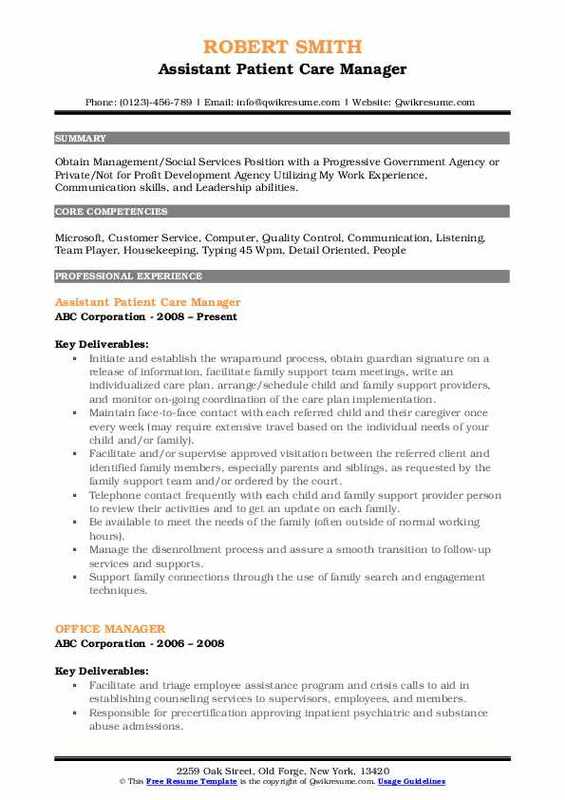 Summary : Obtain Management/Social Services Position with a Progressive Government Agency or Private/Not for Profit Development Agency Utilizing My Work Experience, Communication skills, and Leadership abilities. Initiate and establish the wraparound process, obtain guardian signature on a release of information, facilitate family support team meetings, write an individualized care plan, arrange/schedule child and family support providers, and monitor on-going coordination of the care plan implementation. Maintain face-to-face contact with each referred child and their caregiver once every week (may require extensive travel based on the individual needs of your child and/or family). Facilitate and/or supervise approved visitation between the referred client and identified family members, especially parents and siblings, as requested by the family support team and/or ordered by the court. Telephone contact frequently with each child and family support provider person to review their activities and to get an update on each family. Be available to meet the needs of the family (often outside of normal working hours). Manage the disenrollment process and assure a smooth transition to follow-up services and supports. Support family connections through the use of family search and engagement techniques. Provide opportunities for natural supports to be engaged in the child/youth's life and participate in the care planning process. Headline : Motivated worker with a highly effective communication style. Efficient worker who demonstrates strong time management and prioritization skills. A professional who remains calm and effective in all situations. Strong belief in the importance of patient care and customer service. Administered prescribed medications; performing special treatments; maintaining health records; and, communicating effectively with students, parents and staff. Provided comprehensive nursing services to individuals, families, and communities in the areas of health promotion and disease prevention while safeguarding their integrity and recognizing their right to make their own decisions. Performed vision screening, hearing screening, scoliosis screening, assessment of conditions, and referrals. Appraised the needs of the general student population and special education students with multi-handicaps. Performs a variety of selective individual health assessments and initiates referrals for follow-up. Solicited outside resources to provide dental and vision screening to a student who is underinsured or student without insurance. Organized presentations to selected grades base on health trends noted, for example, oral hygiene, obesity, infection control by teaching effective hand washing and playground safety.